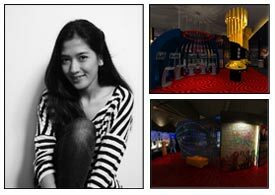 Graduated from Binus School of Design majoring Interior Design in 2012. Indonesia’s Rock Museum is a new museum concept that provides learning in such interesting, innovative, creative and interactive ways that visitors can learn Indonesia’s rock music (experimental learning). The design concept is Mystical Journey. Mystical Journey has been inspired by one of the rock music type – Psychedelic, and teh word Journey itself plays the role in taking us back to the past in order to learn the rock music history. To support the design concept, Psychedelic will be combined with industrial style that emphasizes usability. Psyhedelic is identical with bright colors and integrated with non-symmetrical patterns. Psychedelic is also a representament of flower generation’s way of life, which is tripped under the influence os drugs and other substances that bring about imagination and hallucination on a scene in the mind of the individual. Lighting will be made a bit dim to stimulate mystical effect.